To be most honest with you, there’s a certain kind of drama I’ve just had enough of and it’s the young man in the ghetto movie aspiring to find the social stability that has alluded him. 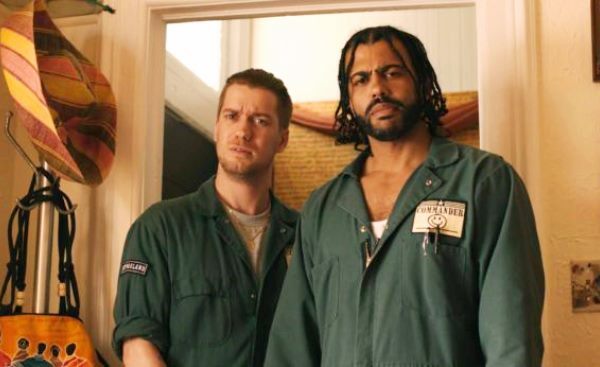 It certainly helps that Daveed Diggs is playing that guy in Blindspotting, and despite my resistance, a performance that savvy and aware was able to captivate me. Diggs is such an incredible talent who is easy to impress (he also co-wrote the movie with his co-star Rafael Casal). Diggs, as Collin, has been on probation for a year after committing a violent act on the job – an act that was half-crazy, half-funny and half-scary in terms of the violence he’s capable of. He’s stuck in Oakland doing probationary time working as a furniture mover with his pal Miles (Casal). His ex-girlfriend disowns him based on his criminal charges past. When the movie opens, he has three days left and one day one witnesses a cop fatally shoot a black man on the run. Collin doesn’t want to risk his probationary release so he fails to report it. That doesn’t make Collin a stupid man. It leaves him grief-stricken but too helpless to get involved. 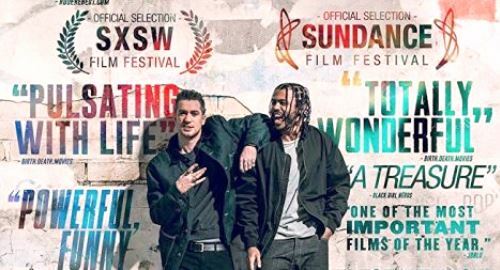 “Blindspotting” is a cut above other slacker movies of its type (don’t give me movies like “Friday,” I’m not interested). A reason for that is that Diggs’ protagonist is a very smart and practical guy, stuck in an economic system that will likely keep him from ever attaining great success, but is definitely capable of picking himself up to do more with his life. He won’t forever be a slacker – if he ever was, you get the feeling he is getting tired of it. There will always be limitations, coming from the Oakland ghetto, but we are confident he can scale into upward mobility more than get dragged down. Actually, not so fast. Miles, as fun as he is, is the type of friend that can drag him down into trouble. This is not a movie where much else can be said beyond the set-up, other than it’s a closely observed slice of life that doesn’t depend (much) on plot mechanizations. One of Diggs’ trademarks as an actor is his poetry slam abilities and here he gets to use them apropos. Sometimes it’s more effective on an adversary than firing a gun at them. It’s a contrived moment, but it couldn’t have been aced better by anybody else. Film Cousins: “Baby Boy” (2001); “Fruitvale Station” (2013); “Sorry to Bother You” (2018); “The Hate U Give” (2018).